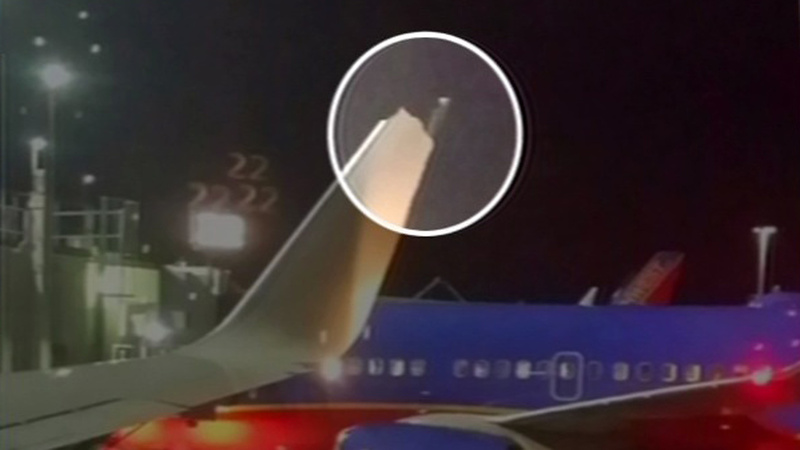 OAKLAND INTERNATIONAL AIRPORT -- Southwest Airlines has launched an internal investigation after a plane's wing-tip was damaged after it clipped another plane's wing at Oakland International Airport. A photo was taken by a passenger on-board Flight 2674 to John Wayne Airport in Orange County last night. The plane was being pushed back from the gate, when the two Boeing 737s came into contact with one another. There were no passengers on the other plane that had arrived from Boise, Idaho earlier Sunday evening. Southwest Airlines tells ABC7 News there were no injuries reported to the passengers or crew. The flight was cancelled and passengers will be rebooked onto other departures leaving today.